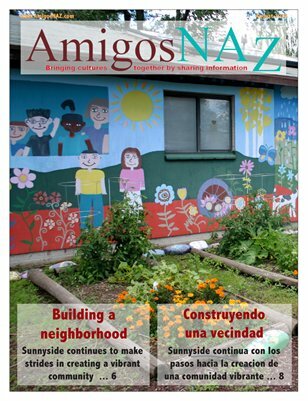 The August 2013 bilingual edition of AmigosNAZ opens with a cover story charting the progress of the Sunnyside neighborhood of Flagstaff, and the challenges that remain. The edition also includes a commentary on programs promoting education and career opportunities; information on upcoming back to school vaccination programs; honors presented to local public officials; an update on the selection of the Coconino County manager; a preview of the Coconino County Fair; a commentary by a county supervisor; a travel story summer vacation options; warnings about taking too many vitamins; simple ways to soundproof a home; learning how some home improvements make you eligible for tax breaks and reasons why dairy in moderation is a good thing. All this and more brought to you by AmigosNAZ — Providing information for and about the vibrant Latino community in Northern Arizona.